The HIMSS (Healthcare Information and Management Systems Society) Global Conference & Exhibition brings together 45,000+ health information and technology professionals, clinicians, executives and market suppliers from around the world. Exceptional education, world-class speakers, cutting-edge products and powerful networking are hallmarks of this industry-leading conference. HIMSS19 will run from February 11 to 15 at the Orange County Convention Center in Orlando, Florida. 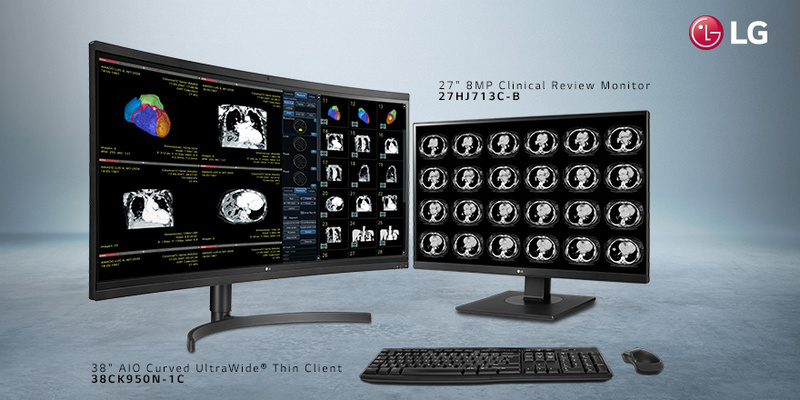 LG will be there, at Booth #1687, showcasing a variety of its U.S. healthcare solutions – advanced medical imaging capture and display devices designed to provide visual confidence while maximizing efficiency in radiology and surgery. Among the products will be LG’s recently launched Thin Clients – secure cloud endpoints in All-in-One (AIO), desktop box and laptop form factors. These products accommodate the shift toward cloud infrastructures and the need for reliable, secure and manageable IT solutions, especially in data-laden and cost-sensitive applications like HIS, RIS and education. LG’s All-in-One (AIO) Thin Clients can push modern Picture Archiving and Communication Systems workstations into their most productive and effective form – reducing components and TCO. In this unique application the AIO Thin Clients do not require a cloud infrastructure; instead, they are used as a pure web browser. The innovative new solution changes today’s PACS workstation setup to make it easier and uncluttered for the end user. It eliminates the large workstation computer, graphics card and bulky cables, and replaces them with an LG 38-inch AIO Curved UltraWide® Thin Client. The AIO Thin Client serves as a computer and also as the worklist monitor, to run PACS web-browser-based applications. Users can connect up to two LG or third-party Review/Diagnostic monitors for a complete PACS solution. Going to HIMSS19? Be sure to see these and other LG medical imaging products at Booth #1687.